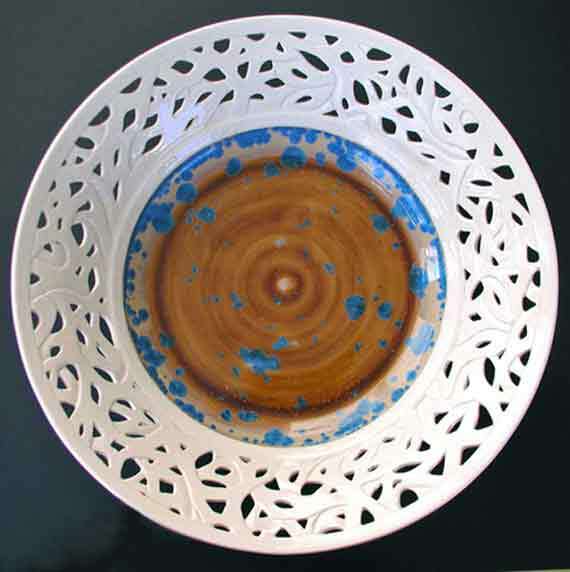 glaze formed a unique, random pattern during the last kiln firing. It is never known in advance where the crystals will appear, their size, and how many will form. Only a general idea of what the colors will be & crystal size is known. All materials used to create this piece are non-toxic and lead free. Do not use in a dishwasher or microwave oven. If necessary, may be hand washed by lightly rubbing with a clean, soft, nonabrasive, cloth, preferably moistened. Mild dish soap is OK to use. Hand carved outer area. Crystalline Glazed inner area. Price includes shipping to most locations. Lengthy firing time of crystalline glazed pieces and high heat firings add to the cost of producing them and their value. Additional carving increases the risk of failure of the overall work. This also adds to its preciousness in terms of value. No major flaws, such as commonly occurring cracks, are seen in this piece, which is rare. There is slight rim warpage. If it were machine made and precision were the goal as part of its function, it might be considered a flaw. In this case, i.e., being a handmade ornamental object, it’s not a design flaw. Crystalline glazed area is easily scratched. Not meant to be used as a serving vessel unless lined with a non-scratch, non-abrasive fitted container or bowl. The liner can be made of glass or plastic. This item must also be stored this way. I.e., don’t stack with other dishes without lining surface with protective paper, bubble wrap, or other nonabrasive materials. Dimensions: approximately 14 1/4 inches Diameter x 3 3/8 inches high. Signed on the underside by artist Joyce Jackson.